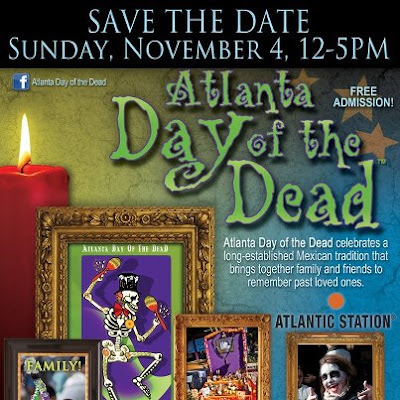 The 3rd annual Atlanta Day of the Dead will take place on Sunday, November 4th from 12-5p at Atlantic Station in the Central Park area. Atlanta Día de los Muertos is a long-established Mexican celebration that brings together family and friends to remember past friends and family members. Atlanta Day of the Dead is an interactive, educational and cultural celebration of Mexican culture. The festival features live musical and cultural performances, traditional altars and activities for children, sponsor displays with free product samples, arts and crafts, and authentic Mexican food. FREE event for all.